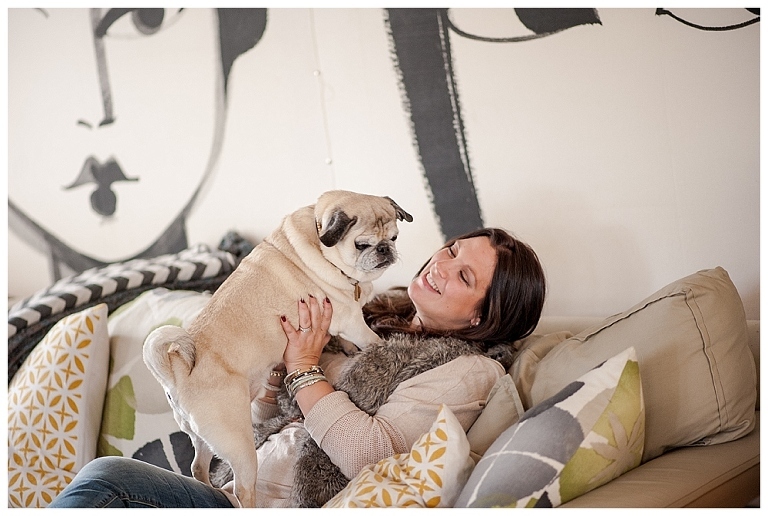 Monty & Moxie MaeWest: Lifestyle Photography with pups and style! Meet Monty and Moxie MaeWest…some very posh pups! Their human, Brianne, is a very dear friend (First a Bride of mine and now my dear friend! Gosh I love what I do!!). Well, Brianne is an animal lover and all around beautiful person, and she very generously helped saved my precious Aggie Cat by donating for her surgery. 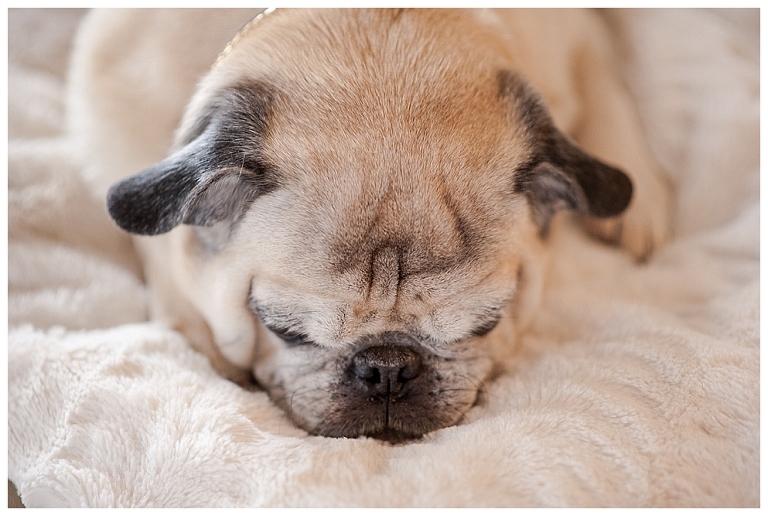 To say thank you (and as a perfect excuse to get together to chat and catch up) I photographed her pups! 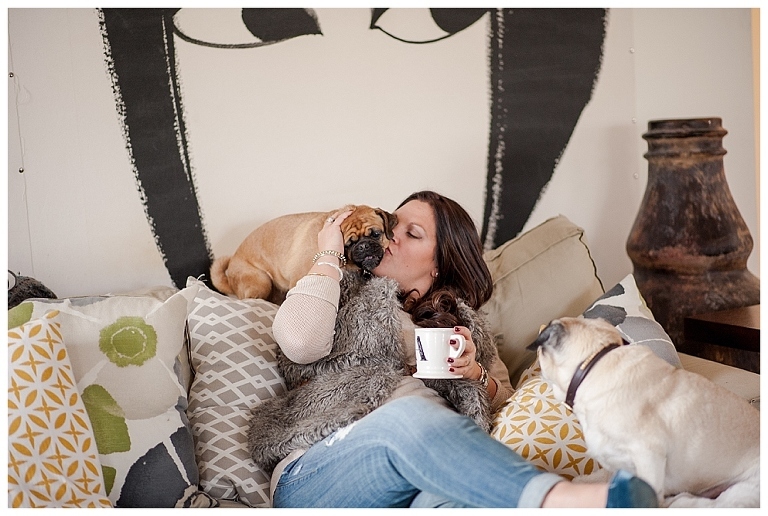 I wanted to the session to be relaxed and really show Brianne and her pups. I wanted to show her sense of style and her life. We started out with a few simple photos of the pups just hanging out. Here’s Moxie MaeWest relaxing with her carrot on the couch. 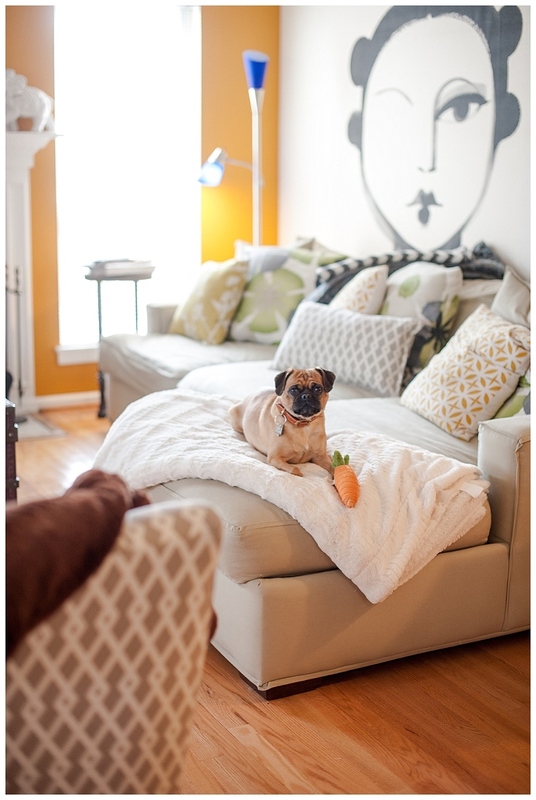 (As a complete side note….I am completely in love with Brianne and Joe’s house! This graphic wall print is to die for!!) Here’s Monty with his mom. Seriously is anything better than relaxing on the couch, sipping coffee, and loving on your fur babies? We headed outside for a few shots. Brianne has one of the most epic collections of killer heels I have ever seen!! Seriously!! This girl has impeccable style. These Christian Dior heels…well i’m not sure if I want to stare at them and drool or if I want to caress them lovingly and write them love poems. oh…and….Moxie MaeWest and Monty look pretty cute too. Hello! Gotta love sparkly gold Jimmy Choo’s and a pug! Some Pug Jimmy Choo love here. Can you ever go wrong with a pair of Christian Louboutins and a cute puppy? Nope…I didn’t think so! I love Moxie MaeWest’s eyes here! Completely cracks me up…her furrowed brow, raised eye brows, and a look of surprise maybe. Kisses are always a good surprise in my book! And can we talk for a second about Brianne’s vest? I’m fairly certain that I need one just like it…and then I’ll have to have someone take pictures of me and Aggie and Archie the Cat! Except for me no wine…maybe a cranberry and vodka. Monty was a bit more camera shy than Moxie MaeWest. Or maybe not camera shy, maybe he was just old man grumpy? Haha. But…having said that…I’m smitten with these next few images. There’s nothing like the love we have for our fur babies! Having lost my amazing Bear Dog just a few months ago my heart swelled with joy and love watching Brianne with her fur babies. And I really wish I had more photos of myself with Bear Dog. I love lifestyle photography sessions! They are seriously the most amazing experience and the images they yield are sure to make your heart full. So many times we are caught up in getting that “everyone looking at the camera” image. Those images don’t bring back memories though. Those images don’t make you smile and say…”yes I remember that…”. Email me today info@amberkayphoto.com to talk about a lifestyle family photography session or a pet lifestyle photography session! Could be the best Christmas present you every gave yourself and your family.